Puressentiel Throat Spray helps to relieve, release, unblock the respiratory tracks and soothe sore throats. It alleviates throat promptly and also relieves teh tired vocal cords. 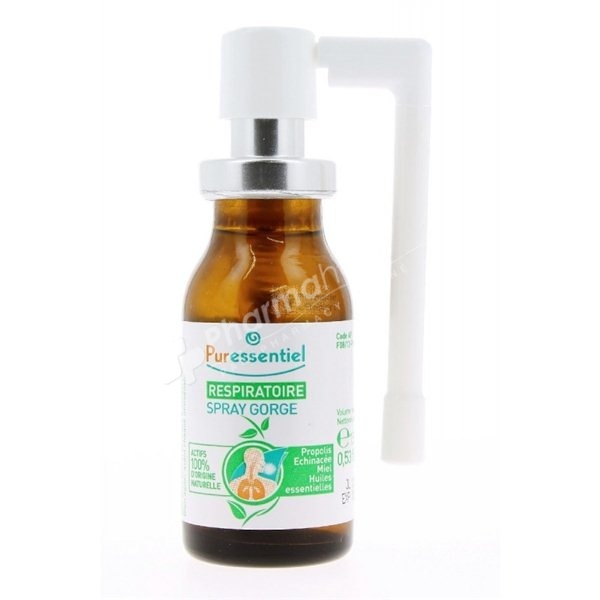 Puressentiel Respiratory Throat Spray helps relieve, clear, clean the airways and soothe the throat irritation. The essential oil Peppermint: nasal decongestant tonic and stimulant, it also has bactericidal properties. The essential oil of eucalyptus radiata: Powerful antiviral and decongestant, it helps you breathe better. The essential oil of thyme thujanol: It helps fight ear infections and infections of the mouth. The essential oil of Rosemary Cineole: It has expectorant and revitalizing properties. The synergy of these oils will help prevent and treat bronchitis and colds, and combat nervous and physical fatigue. Puressentiel Throat Spray is particularly suited to the approach of the cold season and during the winter, to avoid ear infections. Adults: 2 to 3 sprays the back of the throat, 3-6 times a day. Children (over 7 years): 1. spray the back of the throat 3-6 times a day is recommended not to exceed the dose. Water, Sucrose, Vegetable Glycerin, Alcohol, watery extract of propolis (138 mg), Honey (124 mg), Fluid Extract of Echinacea (49 mg), Natural Flavor Origin: Essential Oils of Eucalyptus Radiata, Peppermint , Rosemary Cineole, Junalol Thyme, Lemon Juice Concentrate, Emulsifier: Soy Lecithin. It is recommended not to exceed the recommended daily dose. Disadvised to children under 7, pregnant and breast-feeding women, and also to people with hive-products-allergies.